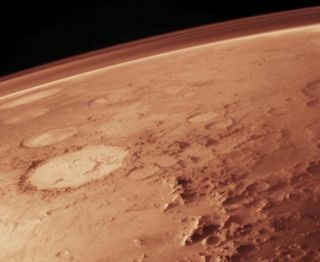 Geological observations suggest rivers and seas dotted the Martian surface 3.5 billion years ago. The amount of water has been equated to a planet-wide ocean half-a-kilometer deep or more. For the planet to have stayed warm enough for liquid water, scientists assume that Mars had a greenhouse "blanket" of carbon dioxide atmosphere at least 1,000 times thicker than what Earth has now. By "down," Brain is referring to the subsurface of the red planet. Water ice is known to be lurking underground, while vestiges of carbon dioxide can be found in the polar ice cap and in certain mineral deposits. But many scientists expect that a large fraction of the water-soaked atmosphere was sucked "up" into space. "We know that escape is occurring today from the Martian atmosphere and that it has occurred in the past," said Bruce Jakosky of the University of Colorado, Boulder. "The more we know about the loss rate now, the better we can extrapolate back in time when Mars was presumably warmer and wetter," said Michael Combi of the University of Michigan. Combi and his colleagues model the outer envelope of Mars' atmosphere, called the exosphere, where particles make their "jump" into space. As part of NASA's Mars Fundamental Research program, they are working on a full three-dimensional simulation that can use MAVEN's observations to say how much water Mars has lost to space. The main ways that atmospheric particles can escape a planet's gravity are ion escape, neutral escape and impact erosion, explains Brain. The last of these, impact erosion, was dominant around 4 billion years ago, when the terrestrial planets were bombarded with large pieces of space debris. Big "splashes" like these would have hurtled large volumes of atmosphere into space, while also introducing water and other material to the surface. The best-measured mechanism is ion loss. This typically occurs when sunlight or a collision ionizes gas molecules in the upper atmosphere. The resulting ions are susceptible to the forces of electric and magnetic fields, which on Mars means that the solar wind can "pick up" the ions and drag them out into space. ESA's Mars Express mission recently measured loss rates of a few grams per second for several ion species on Mars. This is about the same as the ion loss on Earth, which might seem surprising considering that Earth has a strong magnetic field for deflecting the solar wind. However, Mars Express was measuring these rates during solar minimum when the sun produces less ionizing radiation and less wind-whipping solar storms. It's possible that the unprotected Martian atmosphere gets stripped faster during solar maxima or during more active periods in the sun's past. Moreover, ion loss is only part of the picture. Mars is also vulnerable to the loss of neutral atoms due to its comparatively weak gravitational field. Neutral loss occurs on Mars in a variety of ways. Hydrogen atoms can have enough thermal energy to escape the planet's gravity. Heavier atoms, like oxygen, can also escape as a result of energetic chemical reactions or collisions. Caption: NASA's Mars Reconnaissance Orbiter recently detected a huge buried deposit of frozen carbon dioxide -- dry ice -- near the south pole of Mars. The deposit's thickness goes from 600 meters (red) to less than 100 meters (dark blue). A recent calculation by Combi's group found the loss rate of neutral oxygen atoms should be about 100 times greater than the ion loss measured by Mars Express. Taking this as their baseline, the researchers estimate that Mars could have lost a 10-meter-deep layer of water from its surface over the last 3.5 billion years. "The MAVEN mission is the first to have as its sole focus understanding the nature of the upper atmosphere and how it controls the escape rates," Jakosky said. "We have never before had all the right instruments on one spacecraft," Brain says. One of the challenges of past missions has been characterizing a "leak" that is spread over the entire 150,000 square kilometers on Mars' outer atmospheric surface. MAVEN's orbit will be varied in such a way that it samples the loss rate from a wide range of different latitudes, as well as at different times of the day. Still, the satellite can only be in one place at one time, so models like that of Combi's group are needed to fill in the gaps. "These models are absolutely essential for us," Jakosky said. "They will allow us to take the MAVEN measurements that are made at discrete times and locations and extrapolate them to other times and places." "We can't measure what the atmosphere was like billions of years ago," Jakosky said. "However, we can measure it today, measure how the processes that control it work, and then use models to extrapolate to other conditions."